The great archaeologist Dr. Jones has been studying a mystery on C-Island in the southern seas. His nephew, Mike Jones, comes to visit him in the village of Coralcola, but Dr. Jones has disappeared under mysterious circumstances. Mike must cross the southern seas, searching for clues about his uncle's disappearance, and the sudden arrival of monsters around C-Island. Armed at first with only a powerful yo-yo, you must delve into the dark caves of the southern sea islands. 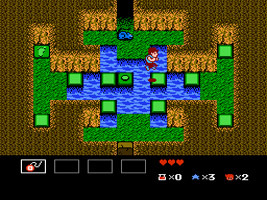 Along the way you will find more weapons, and must solve puzzling traps and take out the monsters and huge bosses to proceed. When you board the Sub-C, you are introduced to the submarine's navigational computer robot, Nav-Com. 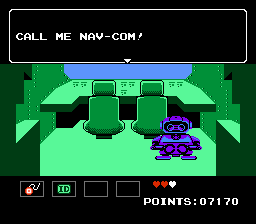 Nav-Com's appearance is based on the Robotic Operating Buddy NES peripheral. In Chapter 5, talk to Fishing Master Hook. He asks if you want to hear the ABC's of fishing. If you answer "No", he asks "Is your name Nester?" Nester was the star of the "Howard & Nester" comic in the U.S. Nintendo magazine, Nintendo Power. He was renowned for his poor attention span.